Seventeen years ago, the US Open showcased a maestro at work as Stefan Edberg put together a flawless display of tennis to defeat Jim Courier. The legendary sportsman reflects on the win, his rivalries and the state of tennis today. 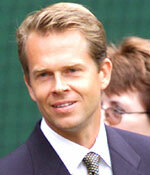 It came as a surprise to many that Stefan Edberg had gone his first eight visits to the US Open without a title. But in 1991, the stars finally aligned for the Swede. Edberg and American Jim Courier both entered their first US Open final on a roll. Edberg, ranked No. 2 at the time, was coming off a straight-sets semifinal win over long-time rival Ivan Lendl. Courier, who did not drop a set en route to the title match, had defeated defending champion Pete Sampras in the quarterfinals and sentimental favorite Jimmy Connors in the semifinals. With the on-court temperatures eclipsing the 90 degree mark, Edberg put on one of the best performances in a US Open final. With a perfect display of serve and volley tennis, he completed a 6-2, 6-4, 6-0 masterpiece victory to capture his first US Open title. Afterwards, Courier said, "I remember walking off of the court knowing there was no way I could have beaten him on that day. He played a nearly flawless match in every facet." Edberg followed it up with a repeat title performance one year later in what would turn out to be his final Grand Slam title, but the 1991 championship remains his favorite US Open memory. "Lifting the trophy after beating Courier was the best match of my life," he says. Courier, who would finish No. 1 in 1992 after Edberg held the top spot the previous two years, said about their rivalry, "I had many a fierce battle with Stefan inside the lines and I consider him one of the all-time gentlemen of our sport. Our match-ups were interesting ones as we had contrasting styles. He knew what I was going to do and vice versa and it was simply a matter of who executed better on the day as to who won." But theirs wasn't the only classic rivalry Edberg was involved in during his outstanding career. The Swede played long-time nemesis Boris Becker 35 times, and also battled countryman Mats Wilander, Lendl, and Michael Chang at least 20 times each. Edberg says, "Thinking back, I was lucky to play in this era of great players." 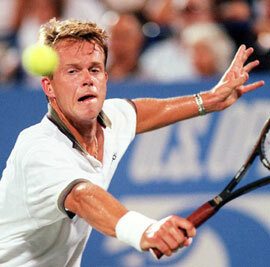 From 1983-1996 when Edberg competed on the ATP circuit, he faced nine players who were current or former No. 1s at least nine times: Jimmy Connors (6-6), John McEnroe (6-7), Lendl (14-13), Mats Wilander (9-11), Boris Becker (10-25), Courier (4-6), Pete Sampras (6-8), Andre Agassi [Images] (3-6), and Thomas Muster (10-0). Edberg, in remembering his own rivals, is highly intrigued by the rivalry between Rafael Nadal [Images] and Roger Federer [Images], which has taken center stage in the world of tennis. "Wherever they play, they reach the final and they've had an incredible run," says Edberg, from his countryside home outside of Grimslov, Sweden. "They have very few letdowns and I've never seen anything else like that. There hasn't been two guys dominating the game the way they've had, as much as they've done. This rivalry is great for tennis and the quality of matches are extremely high level. Now you need a new name or two, like (Novak) Djokovic, and it would be nice to see some new faces coming up." Edberg, who won the ATP Sportsmanship Award so many times it was renamed in his honor in 1996, is impressed by the way Federer and Nadal have handled themselves during their lengthy stays at the top two ranking positions. "What an incredible record to stay at the number one position for 237 weeks to one of the best players ever playing the game," he says of Federer's record reign at No. 1. "It's also a tribute to his sportsmanship as well. "Nadal is a great player with incredible charisma and fighting spirit and he deserves the No. 1 ranking, especially after winning one of the greatest Wimbledon [Images] finals ever following the French Open win." No stranger to playing in championship finals himself, Edberg won six Grand Slam singles titles � twice at Wimbledon (1988, '90), the US Open (1991-92) and Australian Open (1985, '87) � in addition to three Grand Slam doubles crowns. During Edberg's run to his last Slam title at the US Open in 1992, the serve-and-volleying Swede defeated three straight opponents in five sets, including Chang in the semifinals in the longest match in US Open history at five hours and 26 minutes. "That was by far the most difficult Slam tournament in my career," says Edberg, who capped it off with a four-set win over Pete Sampras in the final. "I beat Chang in a marathon and then had to come back the next day to play Sampras." Edberg looks at today's game and says he's a little disappointed not to see any serve-and-volley players like from his era. "You have some bigger servers today but they don't follow-up going to the net. With Boris and Goran (Ivanisevic) you wouldn't get any rhythm and if you dropped your serve it was extremely difficult to come back and win the set. "Being a serve-and-volleyer myself, it would be nice to have one, two or three. The guys are playing good, effective tennis today but it would be nice to have variation of styles. I played Chang and he would stay back. You look at Borg and McEnroe and they had different styles. That would be the only thing I wish � to see variation." But Edberg continues: "Tennis is in pretty good shape right now and Federer-Nadal have played some quality tennis matches. It's also nice to see (Novak) Djokovic playing well and up there." Today, the 42-year-old Edberg is a part-owner and board member of the Swedish investment company Case Assets Management, and lives in the Swedish countryside with his wife Annette and two children, Emilie, 15, and Christopher, 11. And, while he'll be watching the action at Flushing Meadows closely, Edberg predicts that this year's US Open will come down to the Big 3 of Federer, Nadal and Djokovic, with "Federer winning once again!"